Ferienhaus im Finistère - Bretagne: : Manoir "Le Clos des Hortensias : Semi-detached house in one of the manor's wing, set in large grounds (8500m²) overlooking the bends of the tidal river Aulne. Gr.fl: American kitchen and lounge diner with exposed stonework and ornamental fireplace, shower room (balneo)/WC. Upstairs: double-bedded Bedroom1, triple-bedded Bedroom2, small lounge, WC. Electric heating, washing machine, dishwasher, m-wave, SAT-TV (DVD),Wi-Fi. Linen hire. Garden, garden furniture, BBQ. Wooden terrace (sea view). Sense of detail, tasteful decoration and best quality materials do make the difference! 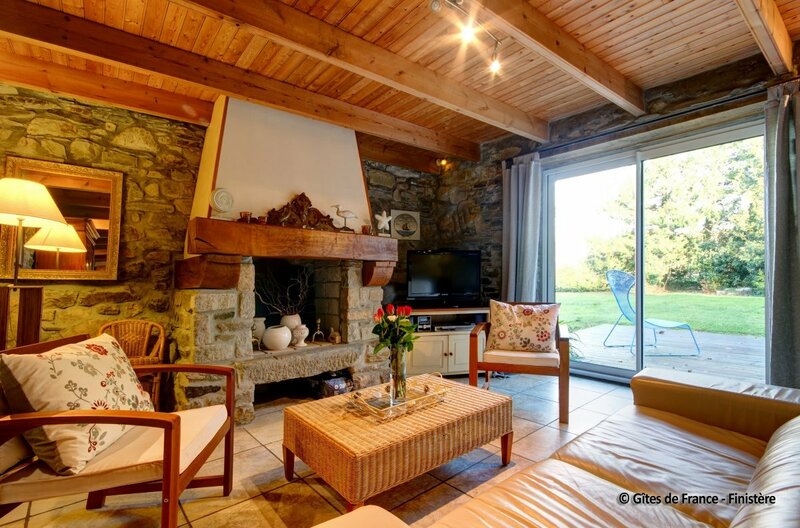 Outstanding surroundings with direct access to the river Aulne. Beaches, footpaths and fishing places all close by.